Olives | Huberti - The relish experts. 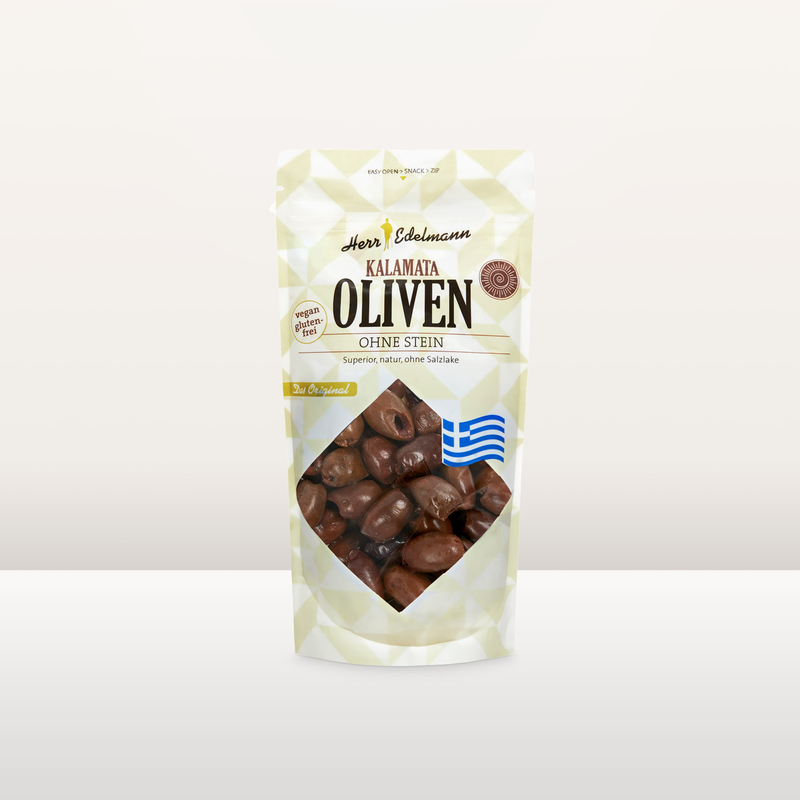 Herr Edelmann Halkidiki Olives (also “Chalkidiki”), grow green on the peninsula of the same name in the east of Greece and have a firm, mild-aromatic fruit pulp. On account of their size they are accordingly referred to as “Jumbos”, they are as such in essence perfect for a delicious bite. We offer them in one piece and pitted – beautiful, oval fruits, hand-picked and full of wonderfully mild aroma. After ripening, they are packaged without infusion. This makes them longer firm to the bite. The practical pouch is resealable and is a beckon to immediately devour the olives in an uncomplicated manner. Open pouch – devour – close pouch! A mixture of herbs from the Provence with rosemary and thyme also additionally refines the olives and makes them the perfect antipasti relish – pure or with roasted bread and cheese. 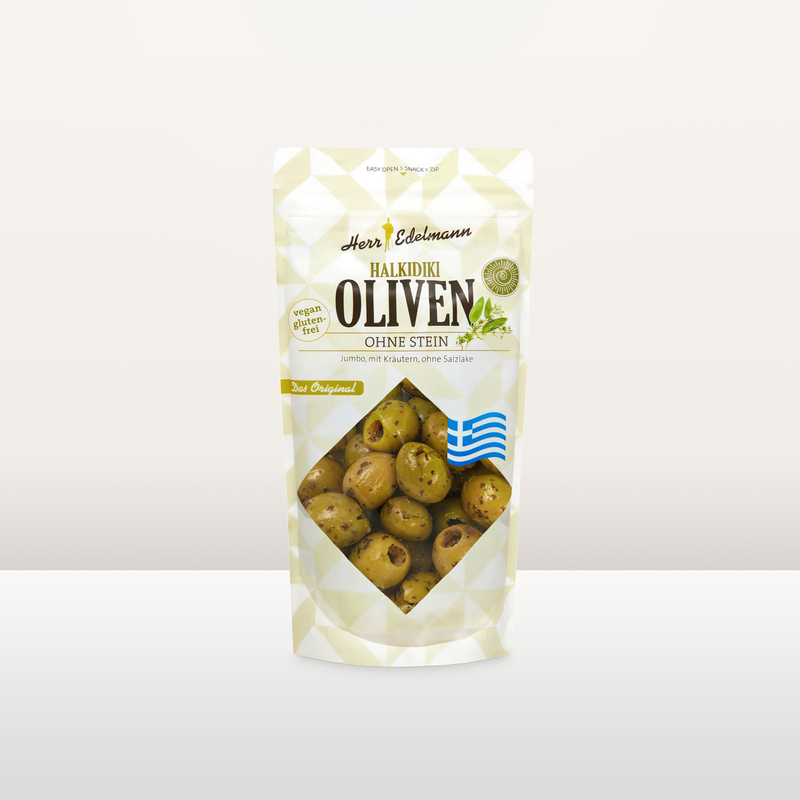 Herr Edelmann Green Halkidiki Olives are a pure natural product without flavour enhancers, without preservatives and without colourings and flavourings. They are by nature gluten- and lactose-free as well as vegan. 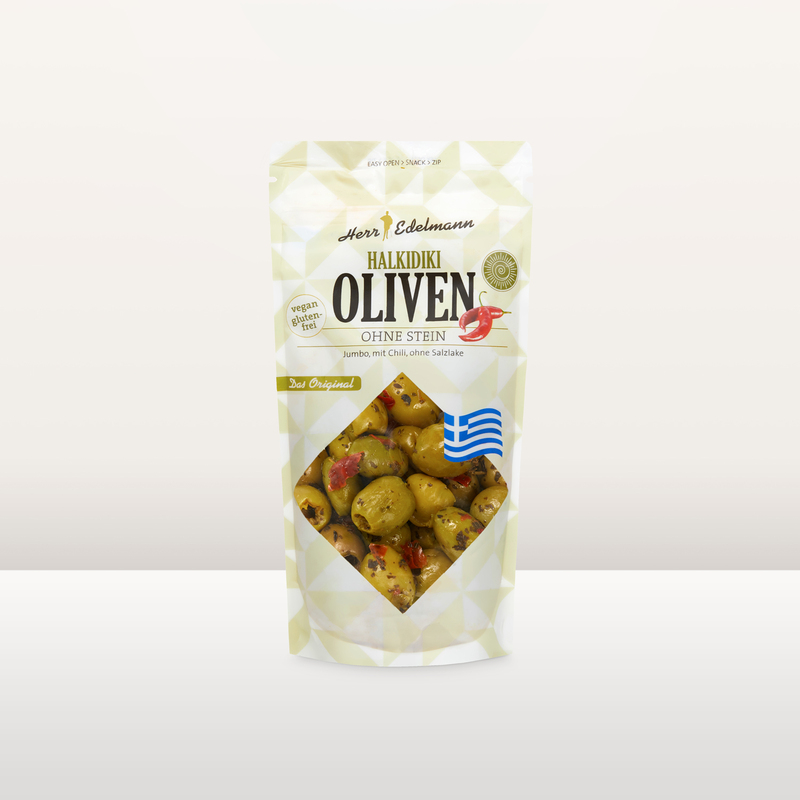 Red chilli from Greece lends the olives a slight pungency and makes them the perfect antipasti relish – pure or with roasted bread and cheese. 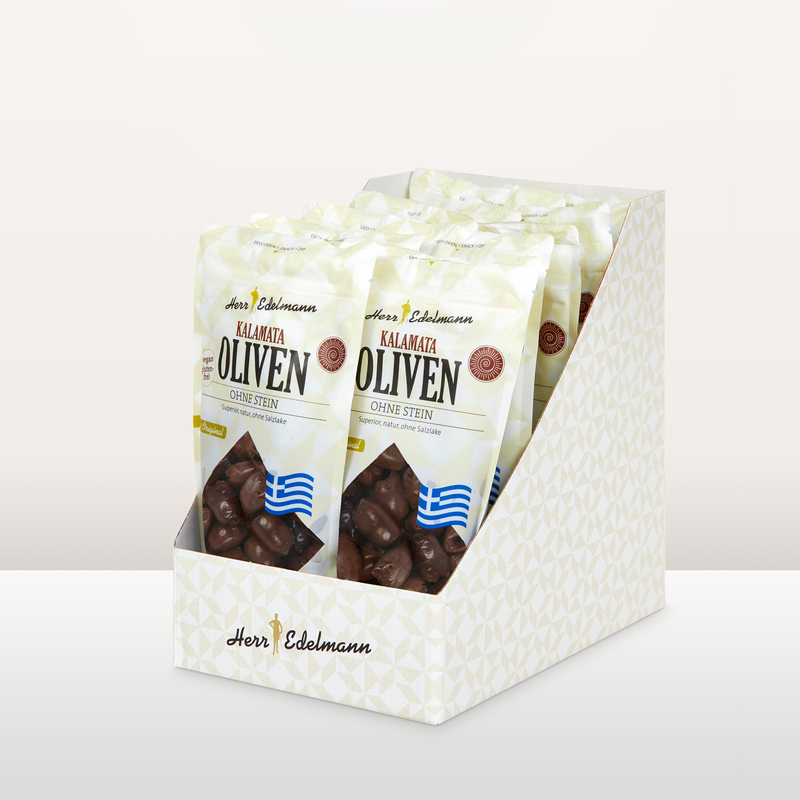 Herr Edelmann Kalamata Olives Natural Black, grow in the region with the same name on the peninsula of Peloponnese in Greece. They mature so long on the trees until they have attained their reddish black colour – a rarity in a market in which a large portion of the black olives is coloured. The fruits of the size Superior come handpicked, pitted and without infusion in the practical, resealable pouch. This makes them longer firm to the bite and can be immediately be devoured in an uncomplicated manner: Open pouch – devour – close pouch! 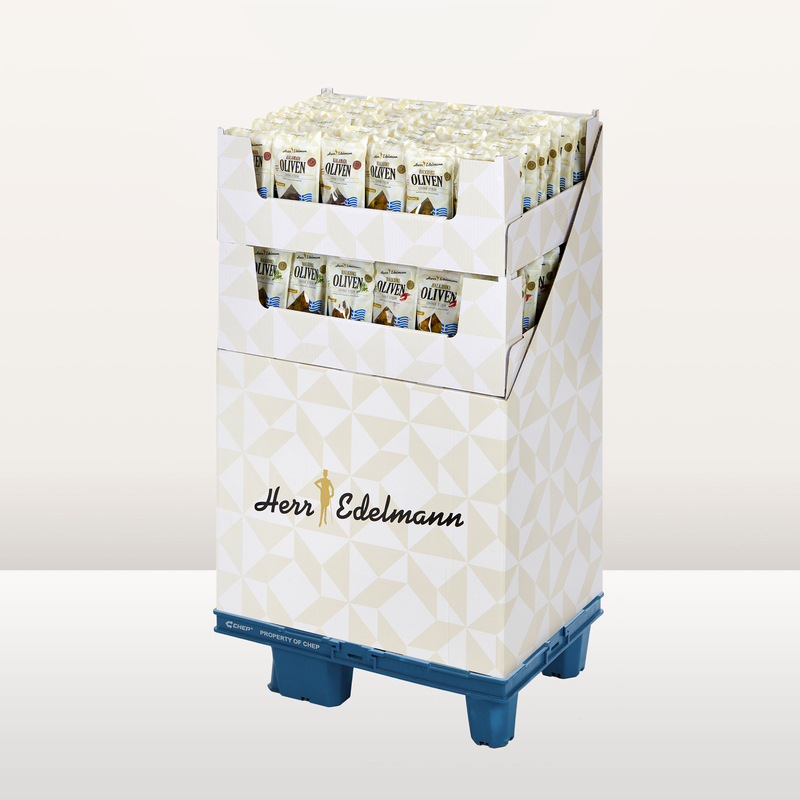 Herr Edelmann Kalamata Olives have a firm, mildly aromatic fruit pulp and taste perfect with roasted bread and cheese, as antipasti, in salads or in Mediterranean dishes. They are a pure natural product without flavour enhancers, without preservatives and without colourings and flavourings. They are by nature gluten- and lactose-free as well as vegan. Available ex warehouse in the resealable stand-up pouches of 150 g – also on 1/4 CHEP-display pallets per 120 pouches.